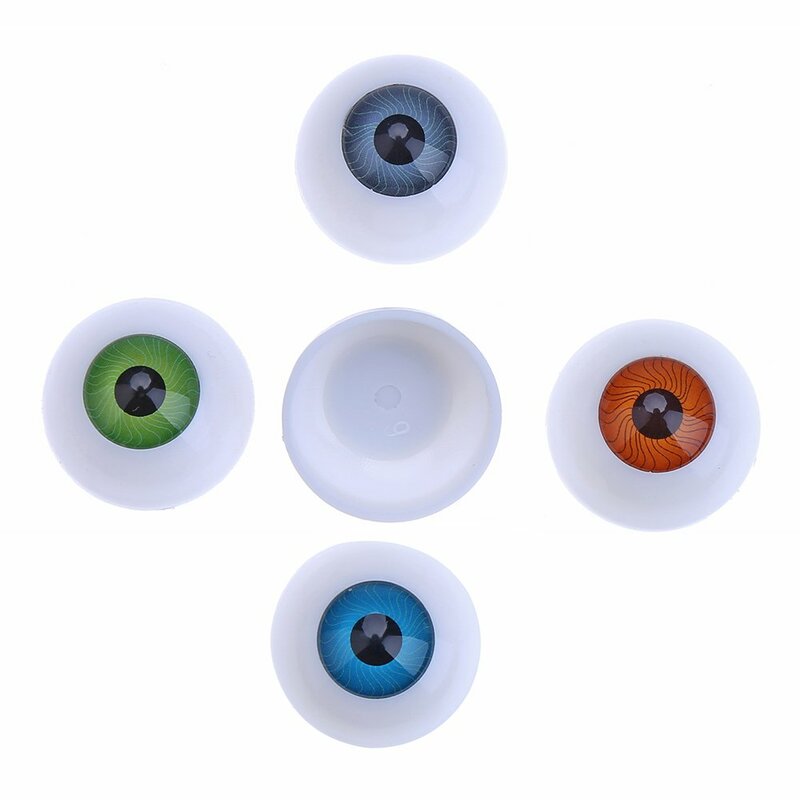 MAterial: these eyeballs are made of plastic with no bubble and pupils are placed and colored in the center. 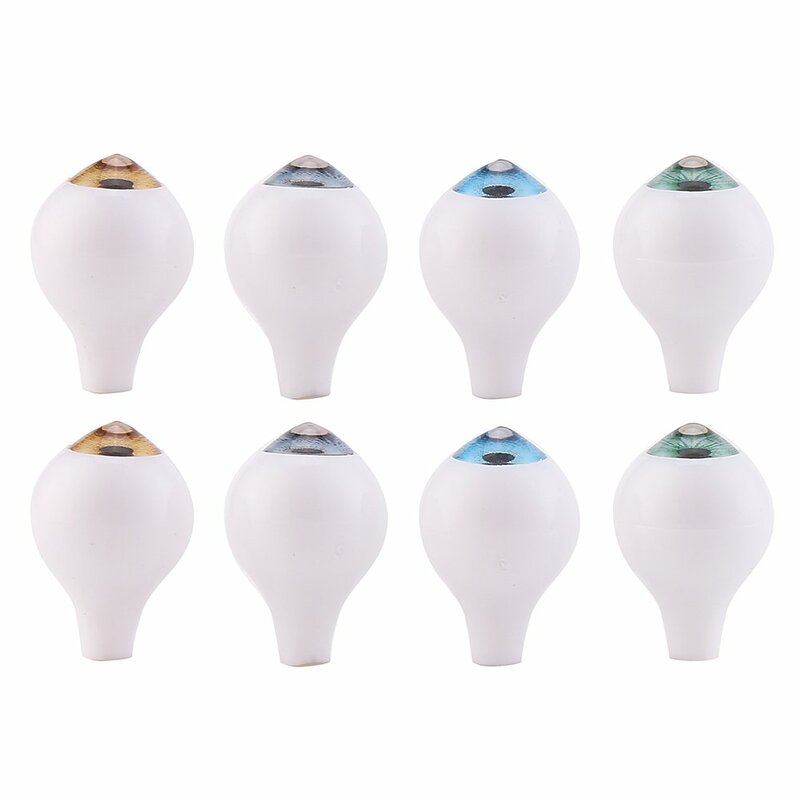 Attribute: the eyeballs are half round and flat in the other side and hollow with great durability and fine workmanship. 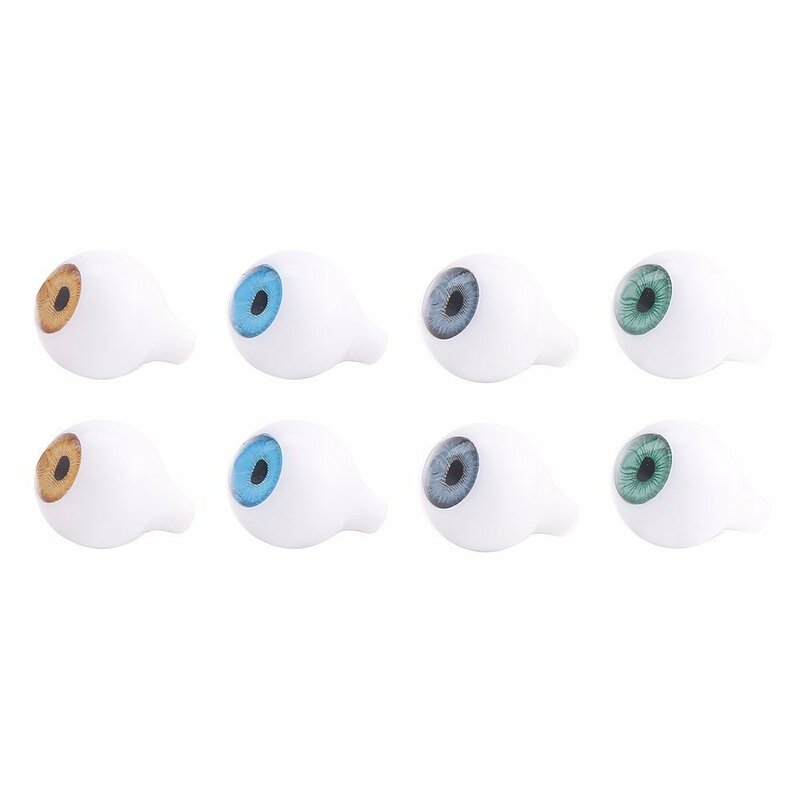 Vibrant Color: one set contains 4 pairs of plastic eyeballs, 2 in grey, 2 in brown, 2 in blue, 2 in green respectively, bright and vibrant. 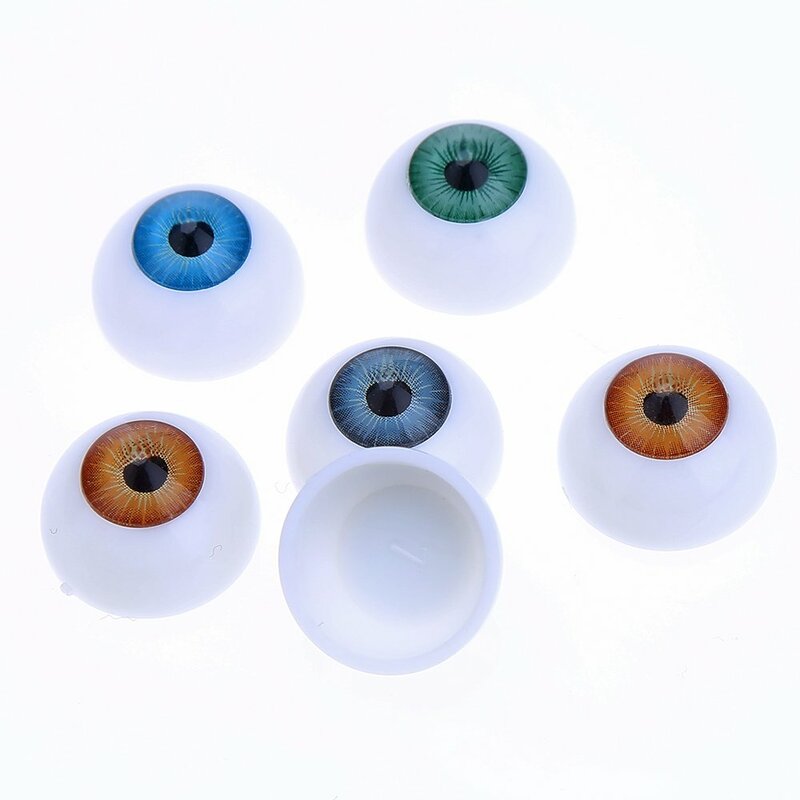 Wide Application: with its vibrant color and good quality, these well-made eyeballs are great craft making accessories, perfect for dolls making, craft sewing, prank props decorating and other uses. 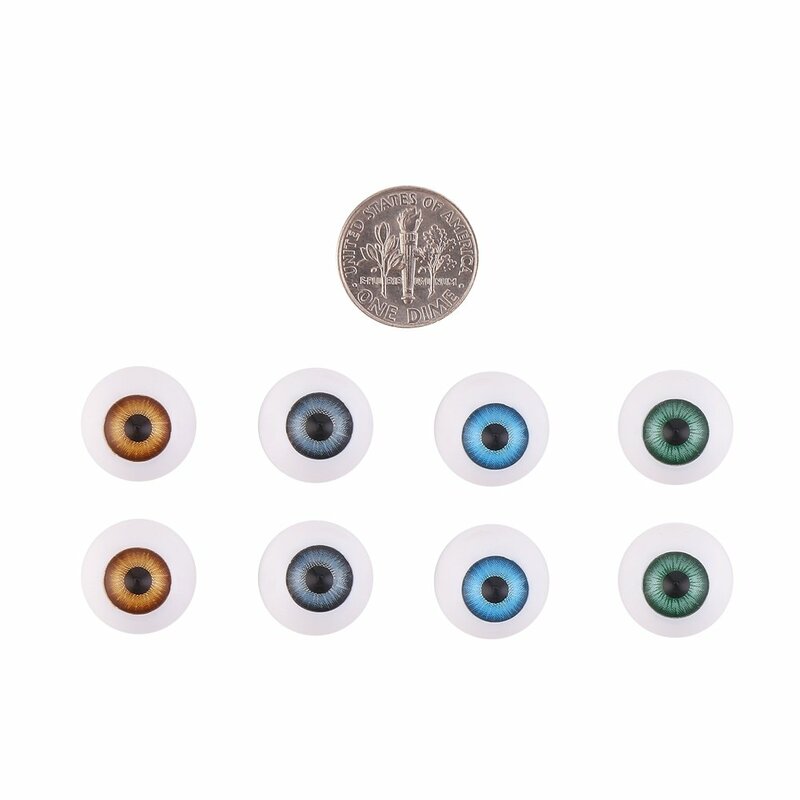 Get Inspired: with great durability, these eyeballs will make your life full of joy and great for creating more fun craft works! 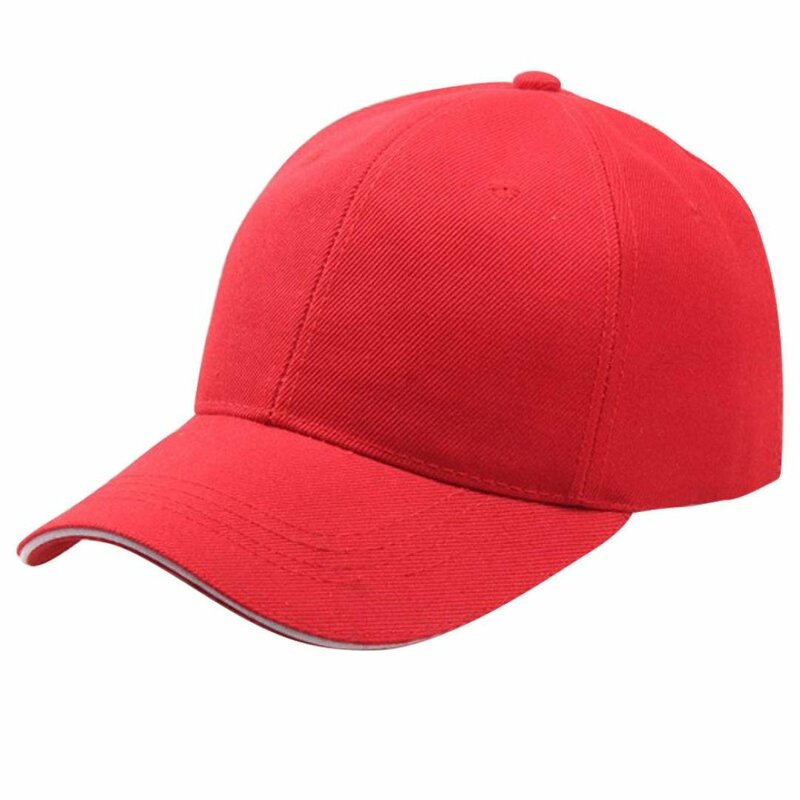 Half round with flat back. I can't even begin to describe how perfect these eyeballs were!! 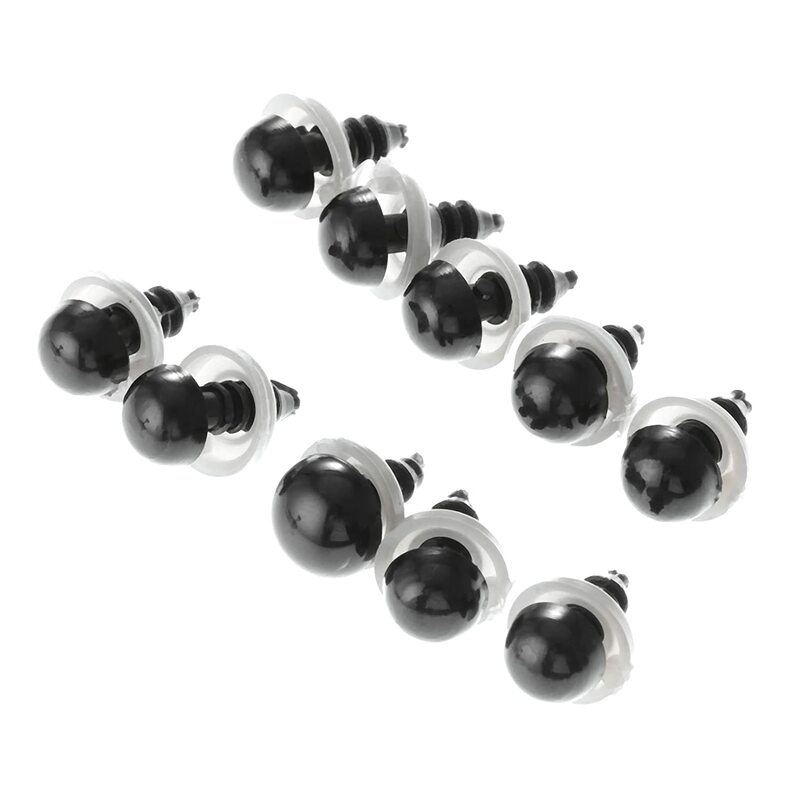 I used them as part of my office desk decorations for Halloween, and they were a huge hit! 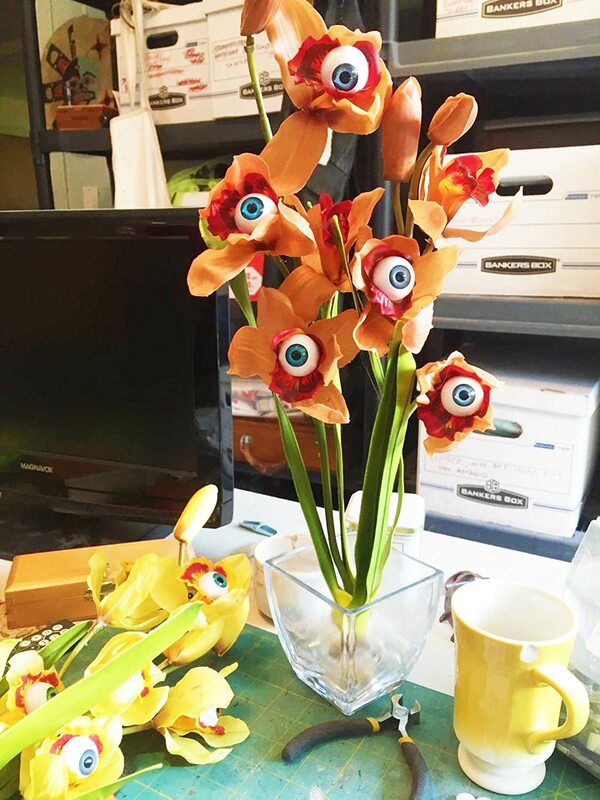 All of my coworkers were so impressed at how creepy and real the eyeballs looked. I ended up gluing them in the center of some fake red peonies and placed them in an old root beer bottle - giving it an old-vintage feel. 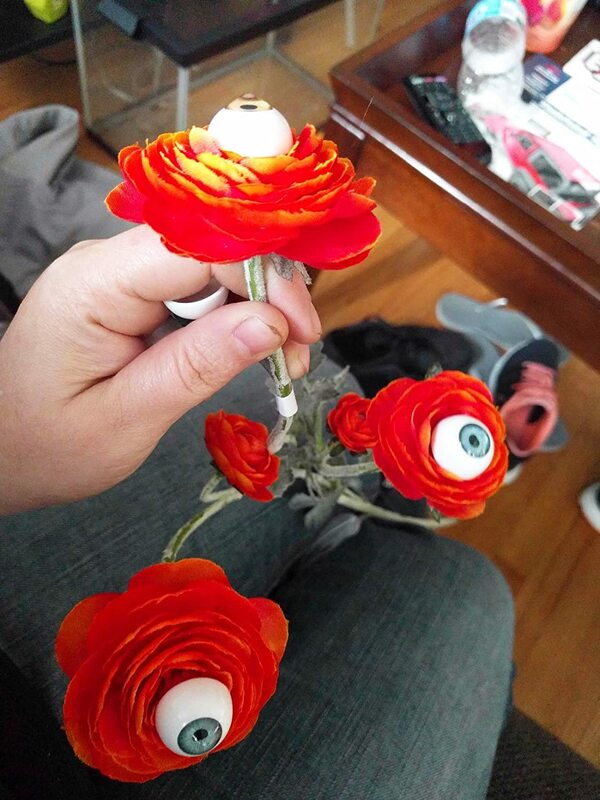 The eyeballs were extremely easy to work with and the hot glue I used didn't damage them in any way. 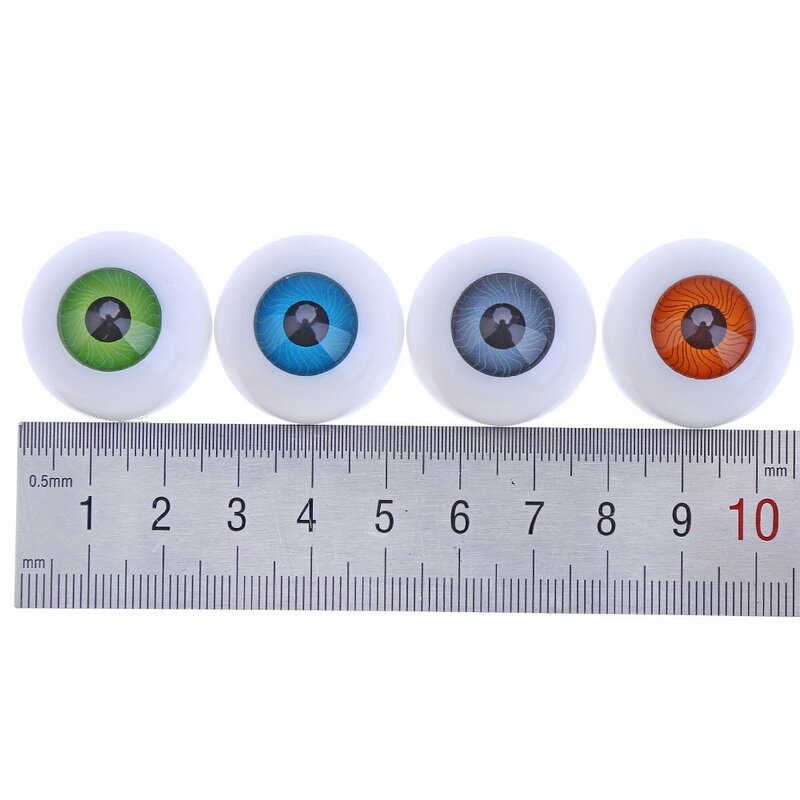 They were the perfect size - 26mm spot on. 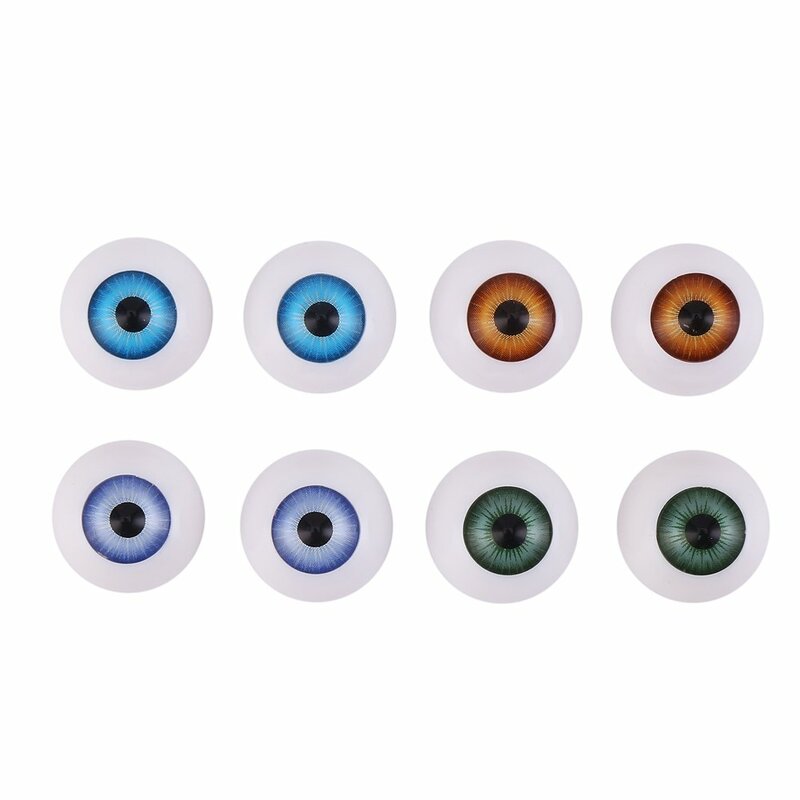 The irises are wonderfully clear and vivid, with just enough shine to make them life-like. 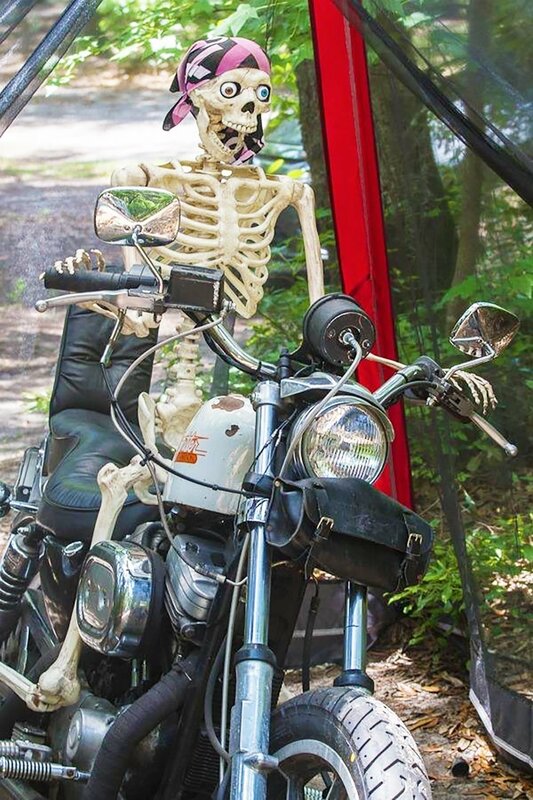 I'm definitely coming back for more next Halloween! 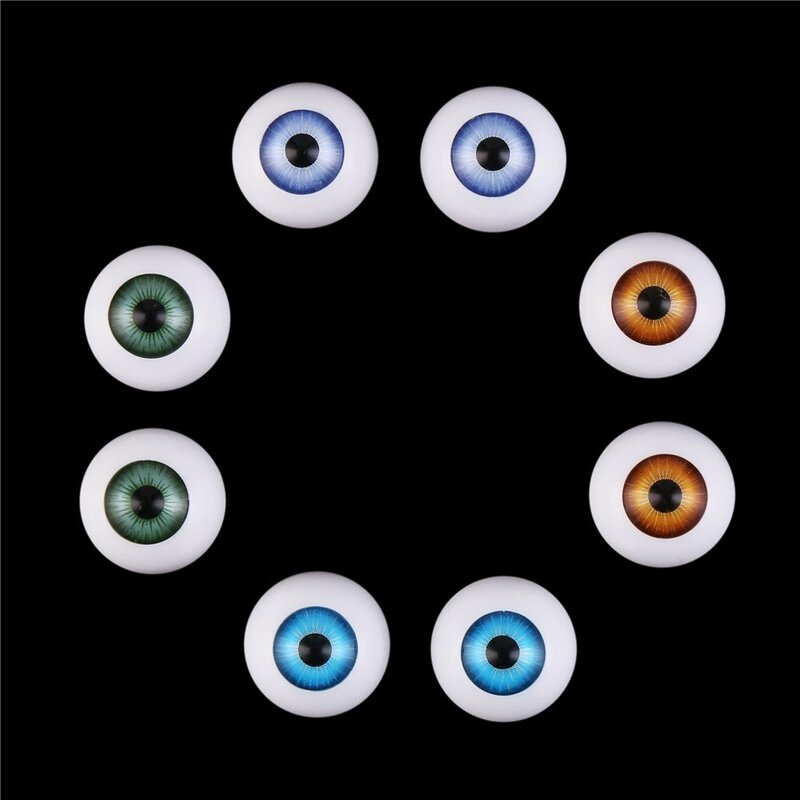 I used four of these (two lost to my poor craft-work) to glue on two eye patches with a slicing razor for a Dali-themed costume party. The idea came from a picture of Dali with an eye painted on an eyepatch as a reference to his surreal film of an eyeball cut with a straight razor. Yes, weird, but I was hard-up for an easy costume. I made the cuts to glue in a safety razor using a hacksaw held between my legs holding the half eyeball at about a 30 degree angle. 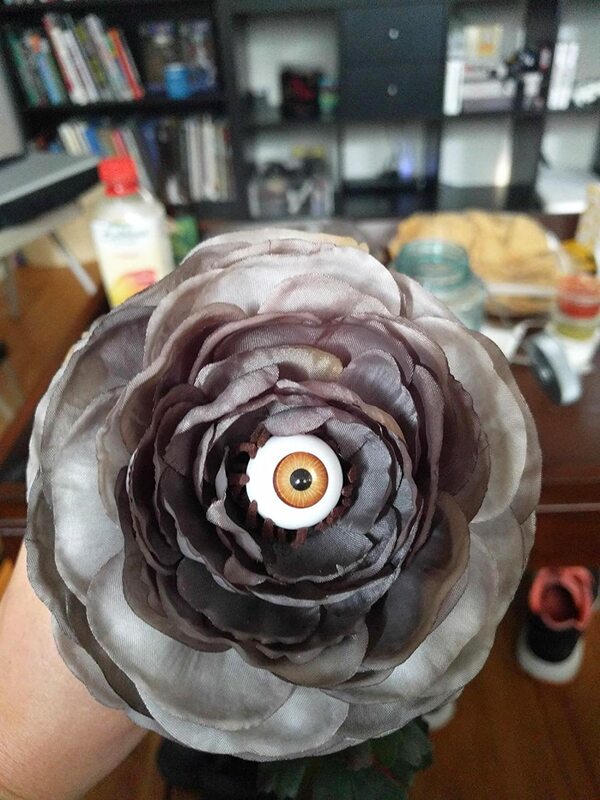 The plastic iris held during this process. I then painted on a an outline of a large eye using my girlfriend's white nail polish. The Ayes have it for a well made half-eye. 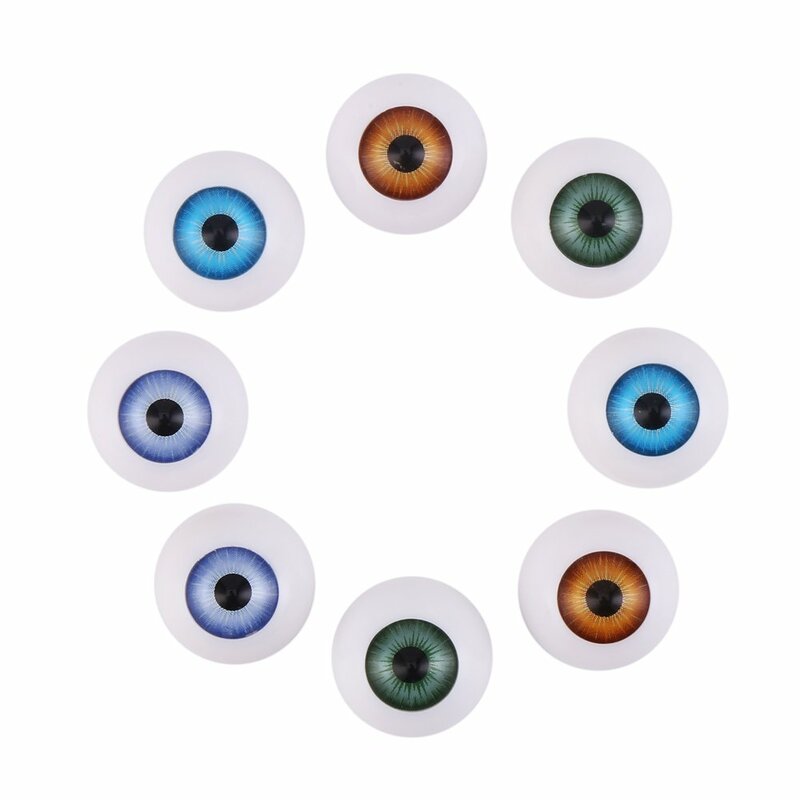 We love these eyeballs. 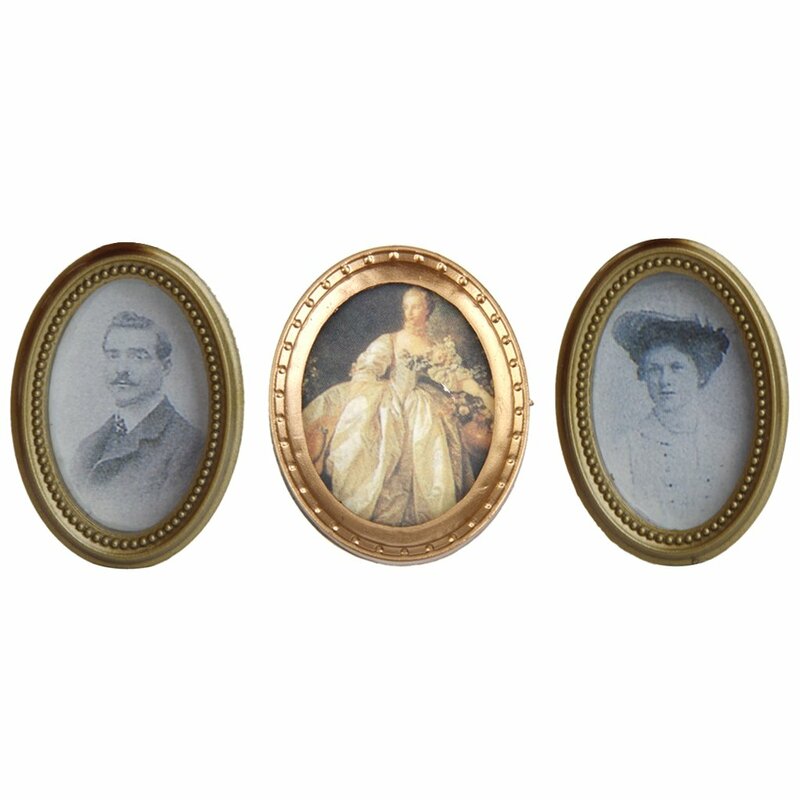 We had fun attaching them to all sorts of odd things. We used one pair on a homemade costume of a gorilla carrying a cage with a human behind the bars. The rubber gorilla mask we were using had holes for the eyes - it was intended to be worn on the wearer's head. But we used the gorilla head on a manikin top for our costume. 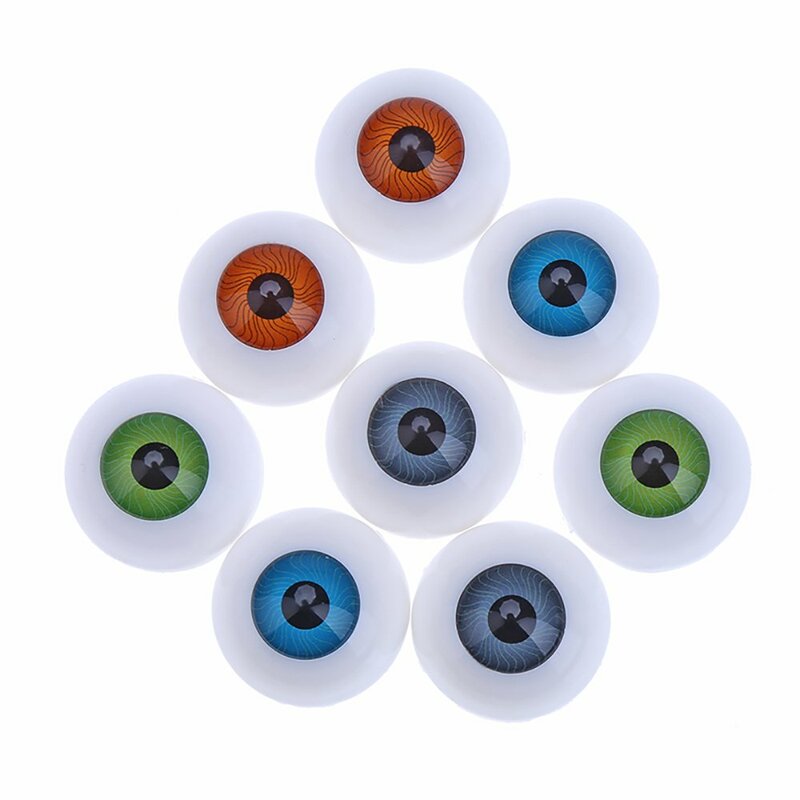 So we used a pair of these eyeballs, gluing them over the gorilla mask's eye-holes. They looked awesome!! 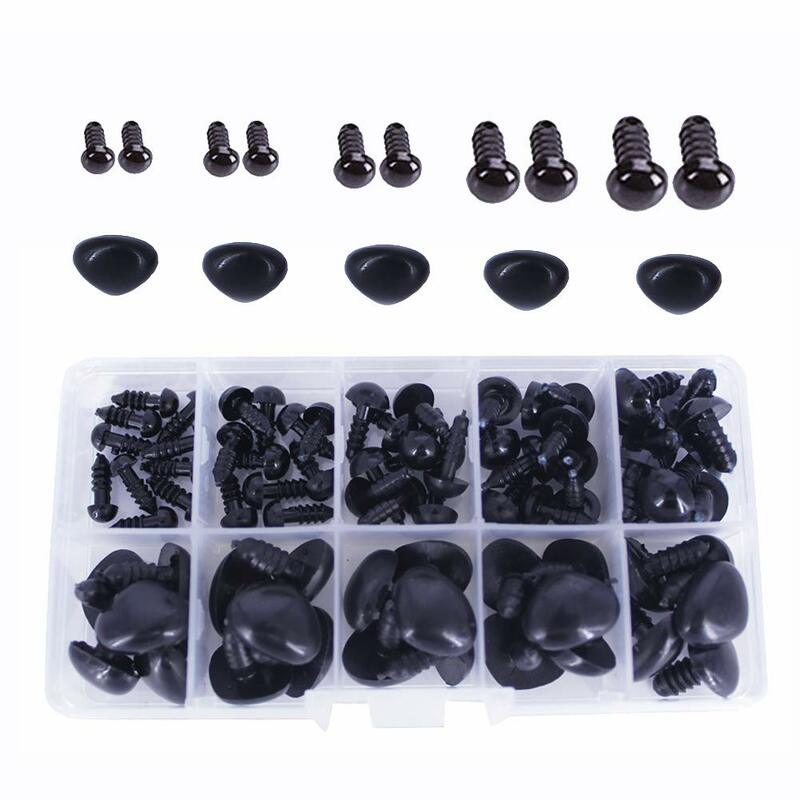 They're good for plastic eyes, but they are very hollow and have no shank on the back. That means they need a lot of back-filling with clay or you'll need to glue shanks deep inside them. Excellent fun. Having a few extra is fun too. I had extra so I added one to the radio knob in my truck. 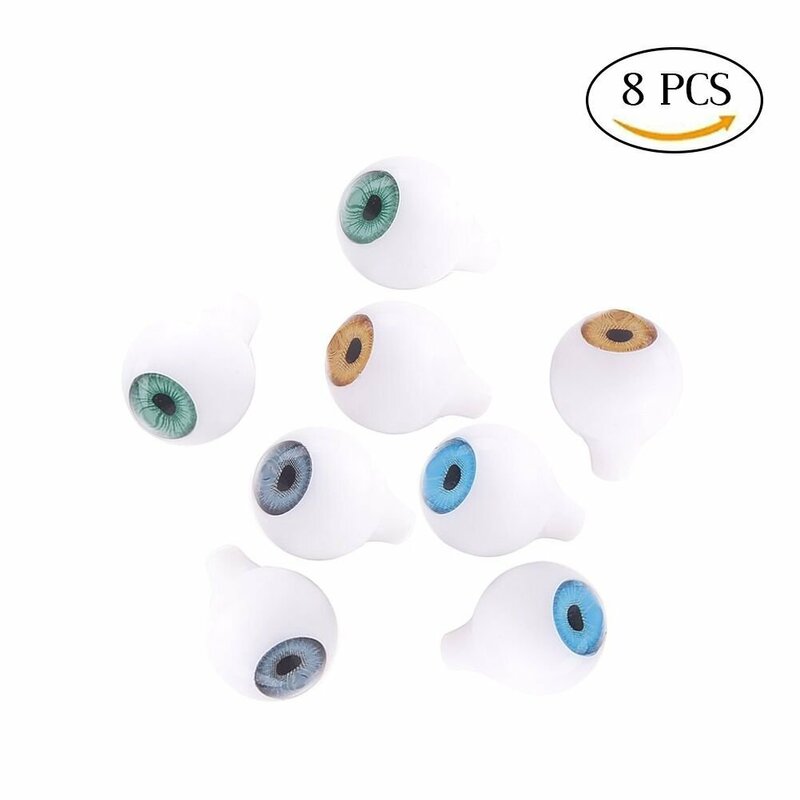 I bought them for dolls, and the pupils are very cheap looking. 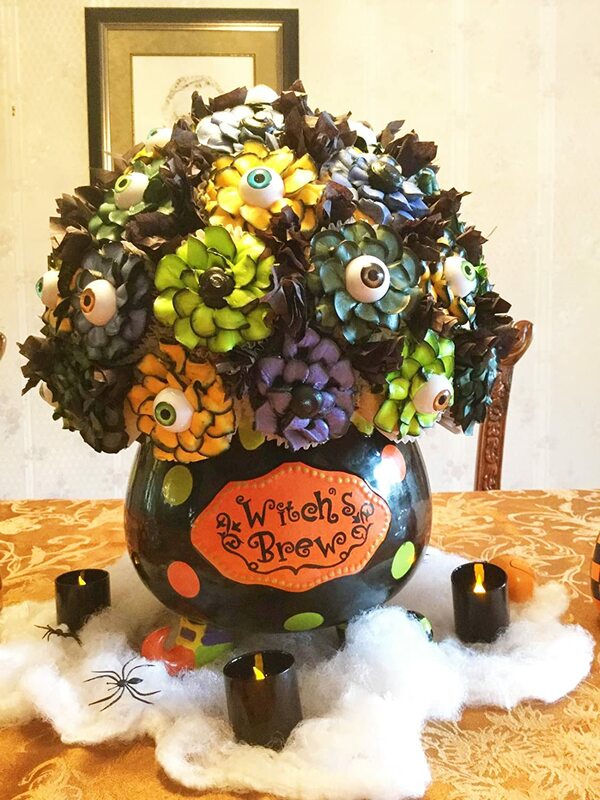 This is more for a cheap craft, or just for a seasonal decoration. 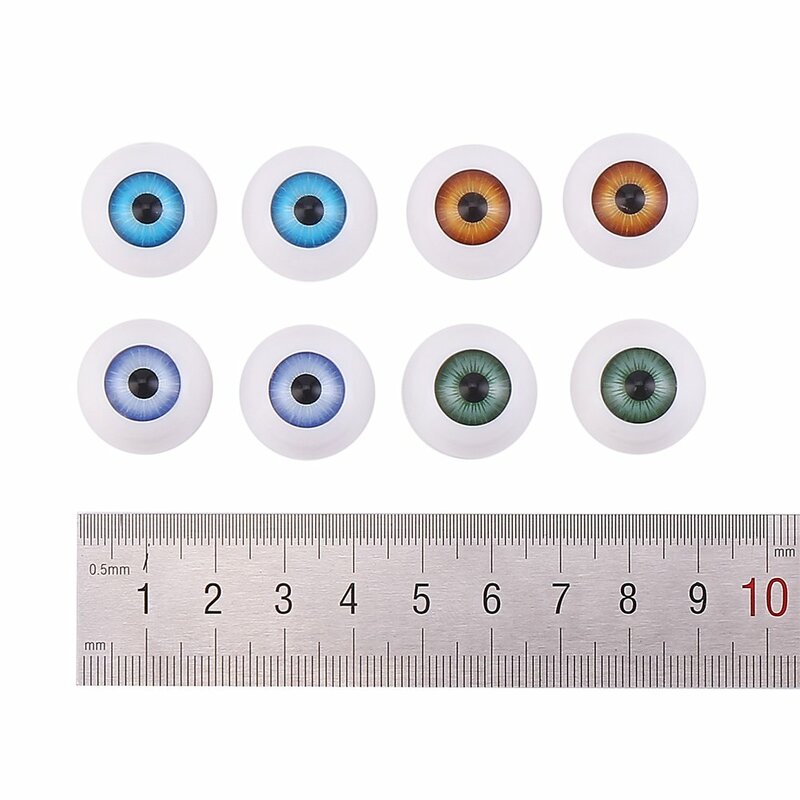 Don't buy this if you are going to make a doll or replace doll eyes. Very disappointed.